Beidh dráma na 3 mhuicíní ar siúl sa scoil amárach ag 09.30. Ba cheart go mbeadh an éide ar na páistí agus iad ag teacht ar scoil. Is féidir an éide scoile a bheith sa mhála scoile acu. Níl gach páiste sa rang ins an dráma seo ach tá fáilte roimh na tuistí ranga ar fad teacht chun féachaint air, fiú muna bhfuil do pháiste ag glacdh páirt ann. Ní leanfaidh sé ach 30 nóim ar a mhéid. Mar is eol daoibh tá seirbhís carúil ar siúl amárach sa séipéal ag 5. Beidh gach páiste sa scoil ag canadh sa seirbhís seo ach beidh na Naí ranganna agus rang Múinteoir Siobhán Ní Núnain 3/4 ag canadh ar an altóir. Beidh na páistí scoile ag suí le chéile mar ghrúpa sna céad suíocháin sa séipéal. Ba cheart go mbeadh an éide scoile á caitheamh acu don tráthnóna. Más féidir bheadh sé deas dá mbeadh hata na Nollag á caitheamh ag na páistí. Bíodh rang Shiobháin Ní Núnáin ag an séipéal ag 4 chun cleachtadh a dhéanamh. Bíodh na Naí ranganna ag an séipéal ag 4.45 le tosnú ag 5.00. Na daoine ata sa dráma scéal na Nollag bíodh an éide ceart orthu, gach éinne eile bíodh an éide scoile orthu le hata na Nollag. Ní cheart go rachaidh seo níos faide na 6.00. Beidh cóisir ranganna againn ar an Aoine. Tá cead ag na páistí milseáin a thógaint leo ar scoil. Tá cead acu bréagáin a thabhairt leo más maith leo ach mar is gnách níl cead na cinn ríomhairí ná dsi/ipad/itouch srl a bhreith leo. Má bhristear srl aon bréagáin ar scoil ní féidir linn a bheith freagrach astu. Mar is gnách ag deireadh téarma -Nollag, Cáisc agus Samhradh- beidh leath lá againn ar an Aoine -naí ranganna agus a dreathaireacha & deirfiúracha ag imeacht ar 12.00. Ranganna 1-4 12.15. Beidh páistí an bhus ag imeacht ag 12.00. Beidh an scoil ag ath-oscailt ar an Luan an 7ú Eanáir 2013 (!) ag 08.50. Guím Nollag faoi shéain is faoi mhaise daoibh! The 3 Little Pigs will be on tomorrow 09.30. The children should wear their costumes to school in the morning and be ready to go onstage. They can have their uniform in their school bags. Every child in the class does not have a part in this drama but all parents are welcome to come and watch, even if your own child isn't in it. The play will only take 30 mins at the most. As you are all we're putting on a carol service tomorrow at 5 pm. Every child in the school will be singing but the Infant classes and Múinteoir Siobhán Ní Núnáin's 3/4th class group will be singing on the alter. The other class groups will be sitting together at the top of the church. All the children should wear their uniforms for the service. It'd be nice too if they could wear Santa hats. Múinteoir Siobhán's 3/4th class group should go the the church at 4.00 for practice. The Infant classes should come to the church for 4.45 so we're ready to start at 5.00. The children who are in the Nativity play should come to the church in their costumes. All other children should wear their school uniform with a Santa hat. The whole service should be finished by 6 at the latest. There will be class parties on Friday. The children may bring sweeties and a toy to school. As usual, electronic games, dsi/ipad/itouches etc are not allowed. The school cannot take responsibility for any toys broken or damaged etc in school. As with every end of term -Christmas, Easter and Summer- there will be a half day on Friday. Infant classes and their brothers and sisters leaving at 12.00. 1-4th classes leaving at 12.15. The school bus will leave at 12.00. The school will reopen Monday 7th Jan 2013 (!) at 08.50. Go leoir 'Christmas Annuals' fós ar fáil san oifig, €4 an cheann.. Plenty of Christmas Annuals still available in the office, €4 each..
Do not forget to check out Nuacht Eile / Other News! Is dócha nach raibh sé soiléir ach beidh éadaí don dráma ag teastáil ó na páistí i gcóir na drámaí ar an Déardaoin. Tá sórt cóta/éide na 3 mhuicíní agus an mac tíre againn. Beidh éide mamaí ag teastáil ón mam agus beidh éide fireann ag teastáíl ó gach éinne eile (na 3 mhuicíní chomh maith) -léine seic agus bríste géine nó mar sin, léine buí so-fheicthe agus aon giurléidí tógáil nó mar sin de. Ní ghá a bheith ró-bhuartha faoin éide. Is féidir leis na scéalaithe a n-éide scoile a chaitheamh mar beimíd ar scoil ina dhiaidh. Ná téir thar fóir. Déanfaidh aon rud an gnó. I gcóir scéal na Nollag le haghaidh Muire bíodh gúna/tunic bánagus éadach gorm uirthi, Íosaf bíodh éadach/gúna donn air. Beidh éide aingeal ag teastáil ós na haingeal -gúna bán, haló de shórt, más féidir, agus sciatháin, más féidir. Le haghaidh na fir lóistín agus na haoirí bíodh sórt gúna/ tunic orthu le túáille tae nó cás pilliúr ar an ceann le banda timpeall orthu. Le haghaidh ne 3 rí is dócha an rud céanna ach b'fhéidir dathanna níos láidre orthu, clóca agus corón. Arís ní ghá dul thar fóir le trioblóid. Drámaí beaga simplí atá á taispeáint againn. Gabhaim buíochas libh as ucht cabhrú. Meabhrúcháín beag go mbeidh cleachtadh ar siúl sa séipéal maidin Dé Céadaoin 19/12/'12. Fág na páistí ag an seipéal in ionad ar scoil. Beidh mé ann ó 08.30. The children will need costumes for their dramas on Thursday. We did talk about it in class alright but perhaps it wasn't clear to all parents that the children needed costumes. My apologies for this. We have three piggy and one wolf coat/costume. Mummy and daddy pig don't have the piggy coats. Mummy will need mumsy clothes, dad can wear a check shirt. The rest of the cast will need maybe check shirts, jeans/trousers, hi-viz jackets and any builder type gadgets you may have around. Don't go buying any gadgets. The narrators can wear their uniforms as we'll be in school after. Don't stress about the clothes, any kind of dress up will do! For the Nativity Mary will need a white dress/ tunic and a blue shawl/ wrap. Joseph will need some kind of brown tunic/ robe and the head cloth. The angels should have a white dress/ tunic/ robe on them with a halo if possible and wings if possible. The Innkeepers and shepherds should have dull/ brown tunics/ robes on with head scarves(teatowels/ pillowcases) and some kind of a band to hold them in place. The kings should wear something similar except maybe in brighter colours with a cloak and a crown. The narrators could dress as angels or in their uniforms. Again, there's no need to stress about these costumes. The kids will enjoy whatever you come up with! Thank you for your help and support. Reminder that we will have practice in the church Wed 19/12/'12. Drop the children there instead of school. I will be there from 08.30. Beidh ceolchoirm na Nollag ar siúl sa scoil ag na daltaí veidhlín ar an gCéadaoin beag seo, an 19ú Nollag 2012, ar a 9.00 (an chéad rud ar maidin). Tá fáilte roimh tuismitheoirí na páistí seo teacht isteach chun taitneamh a bhaint as. 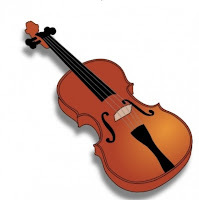 The violin students are having a Christmas concert at school this Wednesday morning, the 19th December 2012 at 9.00 (first thing in the morning). The parents of these children are welcome to come and enjoy it. D'iarradh orm impí ar thuismitheoirí a bheith níos chonsiasaí agus iad ag pairceail lasmuigh don scoil. Táim ag iarraidh oraibh gan páirceáil dúbailte a dhéanamh os chomhair gluaisteáin eile ar maidin mar tá seans ann go bhfuil san ag cur bac le radharc ar pháistí agus iad ag siúl i dtreo geataí na scoile. Chomh maith leis an gcontúirt seo tá sé ag cur moill ar thuismitheoirí eile agus iad ag dul ag obair ar maidin. Chun deileáil leis an easpa spáis sa charrchlós iarraim ar thuismitheoirí gan fanacht timpeall na scoile ar maidin. Tá gach páiste sa scoil in ann siúl isteach leo féin faoin dtráth seo. Más gá pairceáil nó dul isteach sa scoil an féidir smaoineamh ar tiománaithe eile le bhur dtola. Bíodh deireadh seachtain deas agaibh ar fad! 12 chodladh eile!! I have been asked to remind parents to be more conscientious when parking outside the school and in particular not to double park behind other cars. This interferes with the driver's view and it's obviously dangerous for children to walk behind cars that are trying to reverse. As well as being dangerous for the children it delays parents who are trying to get to work if they must wait for people to return to cars that are blocking their exit. To help alleviate the parking chaos I again ask parents not to delay at the school car park in the morning. Every child in the school is well able to walk in themselves at this stage. If you must go into the school on a given morning please remember the other drivers. Have a nice weekend! 12 more sleeps!! Feilíre 2013 - Get your Gaelscoil Chionn tSaile School Calendar before the Christmas Holidays!!! €10 - All profits will benefit the school & your child! Available from Hilda in the office. Or from Kevin Kiely at the gate on the day of the Christmas Show. Each month includes photos of your children & of teachers who have a birthday that month. Maybe buy extras for Nana & Granddad, God Parents, Aunts & Uncles? Clothes for Recycling appeal: We have put back the collection date to the 21st of January 2013. We would like to have a lot more clothes/handbags/ shoes/ bed linen/ curtains collected before the lorry arrives. A big thank you to the people who've brought in bags already. We hope some more bags may be collected during your Spring clean! This recycling initiative will help with our Green Schools campaign that we hope to begin in the new year. The recycling company promotes awareness of recycling used clothes, shoes and mobile phones, reduces items going to landfill, endorses the culture of Re-Use and recycling and has a list of Affiliated Charities. The school will also raise needed funds for itself. Athchúrsáil éadaí: Tá an sprioc dáta curtha siar againn go dtí an 21ú lá de mhí Eanair 2013. Níor bhailíomar go leor málaí fós agus ní theastaíonn uainn an leoraí a ordú go dtí go bhfuil ualach de mhalaí againn. Míle buíochas do na dhaoine a thug isteach málaí. Tá súil againn go mbeidh níos mó ag teacht i rith na glantacháin Earraigh! The school has requested that we create a new Nuacht site to clearly distinguish between official and non official school news. Nuacht will now only have official school information that has been approved by the principal or vice principal but a separate new site "NuachtEile" (Other News) which will be wholly managed by the PA has been setup for sharing other miscellaneous parent and student information relating to non-official school events such as fundraisers, summer camps, sports, music, local activities, etc. This new site is accessible at NuachtEile.gaelscoilchionntsaile.ie. You can optionally subscribe to posts via email by filling out the form under "Nuacht Eile via Email", by clicking "like" on the school Facebook page or by "following" the school on Twitter. All parents are welcome to submit requests for new posts pertaining to non-official school news to NuachtEile by following guidelines under the "New Posting Request" link. The original "Nuacht.gaelscoilchionntsaile.ie" site will remain the official source of approved school news and if you have an email subscription setup you will continue to receive these updates automatically each day. The Parents Association would like to thank Max's for a great fundraiser again this year, we really appreciate it especially this year when funds are so low. It was a great night out and food was wonderful as always. Thanks also to all the volunteers on the nights, who helped make it a great event. Go raibh maith agaibh aris agus Nollaig shona. Guímíd Nollaig Shona agus Athbhliain faoi mhaise dár gcustaiméirí go léir. ATHCHÚRSÁIL- Bailiúchán éadaí - Tabhair tacaíocht den Scoil. ATHCHÚRSÁIL- Bailiúchán éadaí- Tabhair tacaíocht den Scoil. Táimíd ag eagrú bailiúchán d’éadaí nua agus de sean- éadaí. Gheobhaidh an scoil €5.50 do gach 10 kg agus €2 do gach sean fóin- póca ón gComhlacht athchúrsáile. Beidh gach mála bailithe roimh 9.30am ar an 14ú de Mhí na Nollag 2012. Is féidir linn airgead maith a dhéanamh má dhéanann gach duine iarracht mór éadaí a bhailiú, mar sin glan amach an áiléar sin!!!! Faigh a thuilleadh éadaí ó do chomharsain, ó do chol ceathracha srl. Cuir glaoch ar Trish ar 087-947-5367 i gcomhair a thuilleadh eolas. ALSO, OLD MOBILE PHONES (placed in a separate bag). In return our school will receive €5.50 per each 10kg bag of clothes and €2.00 per each old mobile phone. All bags will be collected before 9.30am on Friday 14th December 2012 so please drop your bags of recycling into the school before this. Please note the more bags of recycling we collect the more money we will receive so please feel free to spread the word to family, friends, and neighbours as they are all welcome to contribute bags of recycling. Contact Trish Ryan on 087-947-5367 for further details. Tá am dráma Na Trí Mhuicíní na naíonáin shóisearacha athruithe chomh maith go 09.30 maidin Déardaoin. Ní raibh sé luaite sa nuacht deireanach. The Junior Infant's Three Little Pigs drama has also been moved back to 09.30 on Thursday morning. It wasn't mentioned in the last notice! Amannta na Dramaí athraithe / Change of Times of plays in school classrooms. Amannta dos na drámaí ranga athraithe anois go dtí 9.30 ó 11.00. Tá súil agam gon-oireann an t-am seo níos fearr daoibh. The drama times in the class rooms are now changed to 9.30 ó 11.00. I hope this time suits you better. Maith dom muna raibh fógra an lae inné soléir. Rinneamar cinneadh cúpla bliain ó shin go ndéanfadh gach ré-rang dráma na Nollag a cur ar siúl gach bliain. Naí bheaga, Rang a hAon, Rang a trí srl. Is iomaí cúis a bhí leis seo. Uallach oibre na ranganna éagsúla, ullmhúcháin dos na sacraimint srl. Sa chóras seo chomh maith déanann gach páiste dráma gach dara bliain. Rinneamar ár ndícheall halla a fháil chun seó mór a cur ar siúl cosúil le blianta eile ach ní fhéadfaimís ceann oiriúnach a fháil. Dá bhrí sin shocraíomar ar iad a cur ar siúl sa scoil i ceann dos na seomraí ranga. Tuigim go mbeidh deacrachtaí ag daoine freastal orthu ach ní seó mór a bheidh i gceist iontu pé scéal é. Níl an spás ann ins na seomraí chun deileál le grúpa abhalmhór mar sin más féidir libh freastal agus a bheith sa lucht féachanna go hiontach, tá fáilte romhaibh ach munar féidir níl leigheas ar an scéal. Rinneamar ár ndícheall halla a fháil, dá mbeadh ceann againn bheadh seo mór againn ach faraoir níl. Toisc nach rabhamar in ann halla fháil don dráma cheapamar go mbeadh sé go deas seirbhís carúil na Nollag a cur ar siúl sa séipéal. Beidh roinnt páistí ó na Naíonáin Shóisearacha ag tabhairt léiriú ar scéal na Nollag ann chomh maith. Beidh rang iomlán na Naí Shóis agus an dá rang Naí Shíns ag teastáil chun na hamhráin a canadh. Tar éis an taispeántas sin cuirfidh (rang 2,3 agus 4) cór na scoile seirbhís carúil le hamhráin éagsúla na Nollag ar siúl. Tá fáilte roimh gach rang/clann sa scoil freastal ar seo. Iarfaimid ar na páistí suí chun tosaigh lena ranganna féin chun cur leis an gcanadh. Beidh seo ar fad ar siúl ar Déardaoin an 20ú Nollag 2012 i Séipéal Naomh Eoin ag a 5 a chlog. Beidh cleachtadh ag teastáil ó na ranganna Naíonáin ar an Luan an 17ú agus Dé Céadaoin an 19ú. Nollag 2012. Ar an dá lá san tóg do pháiste go dtí an séipéal i gcóir 08.50 in ionad an scoil. Siúlfaimid go léir, mar ghrúpa that nais go dtí an scoil, ina dhiaidh má tá an aimsir oiriúnach. Muna bhfuil, gheobhaimid bus. Ní bheidh na ranganna eile ag cleachtadh sa séipéal ach sna ranganna. Tá súil agam go bhfuil na socraithe níos soiléire anois. Forgive me if yesterdays post was not clear. We made a decision a few years ago that every second year would do a Christmas show every year. Junior infants, 1st Class, 3rd Class etc. There are many reasons for this. Various classes workloads, preparations for the sacraments etc. In this way also each each class does a show every second year. We did our best to get a hall to put on a big show like other years but we could not get a suitable one. Because of this we decided to hold them in the school in one of the classrooms. We understand that there will be difficulties for people attending them but they won't be big shows anyway. We do not have space in the classrooms to cater for a huge crowd so if you can attend and be in the audience great, you are welcome but if you can't we can't solve this problem. We did our best to get a hall. If we had one we would have a big show but unfortunately we don't. Because we weren't able to get a hall for the drama we thought it would be nice to have a Carol Service in the church. Some of the Junior Infants will be doing the Nativity play there also. The whole Junior Infants class and both the Senior Infants classes will be needed to sing the songs. After this presentation the school choir (2nd, 3rd and 4th Class) will have a Carol Service with various Christmas carols. Every class / school family will be welcome to attend this. We will ask the children to sit in front with their own classes to join in with the singing. All of this will be held on Thursday the 20th December 2012 in St. John's church at 5 o' clock. The Infant classes will need practice on Monday the 17th and Wednesday the 19th December 2012. On these two days bring the children to the church for 08.50 instead of bringing them to the school. We will all walk back as a group to the school afterwards if the weather is suitable. If not, we will get a bus. The other classes will not be practicing in the church but will in the classrooms. I hope these details are clearer now. Beidh Rang a 3 ar fad le chéile ag dul go dtí Blackrock Castle Observatory amárach, an 6ú lá de Mhí na Nollag 2012. Tabhair €10 isteach chuig Hilda san oifig chun chuid den chostas a chlúdú. All of 3rd class together are going to Blackrock Castle tomorrow the 6th of December 2012. Please contribute €10 towards the cost. Students are to wear their full uniform and a coat. They will need a packed lunch also. They will be back at school by 2.00. Tá an scoil ag tacú le Chomhlacht an Naomh Uinsinn de Pól i mbliana i ndá slí. Ciseán Nollag a cur le chéile do dhaoine áitiúla. Bréagáin a bhailiú le feachtas 2FM. Déanfaidh gach rang cis a cur le chéile le gnáth-bhianna nach lobhtar go héasca mar shampla Pasta, rís, pónairí, earraí stáin - brioscaí, milseáin, rudaí deasa chomh maith! Mar sin, seol isteach aon bhianna oiriúnacha le do pháiste an tseachtain seo chugainn go dtí 15ú Nollag 2012. Baileoidh Cumann Naomh Uinsinn de Pól iad ansan. An dara bailiúcháin ná bréagáin nua, gan clúdach. Is féidir iad a thabhairt go dtí an scoil agus cuirfidh an scoil ar aghaidh iad chun cur leis an bhfeachlas ar 2FM. Tá sé socraithe go mbeidh seó na Nollag ar siúl ar Naí Bheaga, Rang 1 agus Rang 3 i mbliaina. Ní fhéadfaimís halla a fháil agus mar sin is gá dúinn iad a cur ar siúl sa scoil. Toisc easpa móir spáis sa rang táimid ag súil is ag braith ar nach mbeidh ach duine nó beirt ar a mhéid ag gach páiste. Béidh seóanna móra againn arís sa todhchaí ach ní i mbliana. Beidh fáilte roimh cách idir tuismitheoirí, deartháireacha agus deirfiúracha sa séipéal ar Déardaoin 20ú. In dteannta san beidh seirbhís carúil na Nollag agus Scéal na Nollag á cur ar siúl againn tráthnóna Déardaoin ag 5 a chlog i Séipéal Naoimh Eoin thíos faoin mbaile. Táimid ag tnúth go mór leis! Beidh cleachtadh ar siúl sa séipéal maidin Dé Luan agus Dé Céadaoin do do ranganna Naí Bheaga agus Naí Mhóra @ 8.50 mar sin is féidir iad a fhágáil ag an séipéal na maidin san in ionad ar scoil. Beimid ag siúl aníos i ndiaidh an chleachtadh muna bhfuil an aimsir ró-olc. Putting a Christmas Hamper together for local folks. Each classroom will put together a hamper with staple, non-perishable foods for example pasta, rice, beans -> tinned goods - biscuits, sweets, nice things too! So send in any suitable foods with your children this week or next week up to the 15th December 2012. The St. Vincent de Paul Society will collect them then. The second collection is for new, unwrapped toys. They can be brought to the school and the school will send them on to the 2FM campaign. It has been decided that the Junior Infants, 1st Class and 3rd Class will be doing the Christmas show this year. We couldn't get a hall so we have to hold them in the school. Thursday 20th December 2012-> Junior Infants. As there is a shortage of space in the classroom, we are hoping and depending on there being a maximum of one or two people with every child. We will have big shows again in the future but not this year. Everybody will be welcome-parents, brothers and sisters etc. in the church on Thursday 20th December 2012 where we will put on a Christmas Carol service and Nativity play in St. John's church in town. We are really looking forward to this! There will be practice at the church on Monday 17th Dec. 2012 and Wednesday 19th Dec. 2012 mornings for Junior and Senior Infants @ 8.50 a.m. so they can be dropped off at the church on those mornings instead of at school. We will be walking up to school after the practice if the weather isn't too bad. We made €827 on the raffle tickets for the SuperValu Hamper. Thanks to all who gave their time to sell tickets on behalf of your scoil it was a great success. Also a big Thank You to SuperValu who donated the hamper. The ticket was drawn this morning by a student in 4th class and the winner was Mary McCarthy, well done Mary enjoy!! Seo iad na griangraifeanna agus na físeanna dos na páistí ag céiliúradh ceol traidisiúnta sa scoil i rith mí na Samhna. Rinne siad ceol ,ealaín agus tionscadail bunaithe ar cheol traidisiúnta. The next Parents Association Meeting will take place tomorrow, Tuesday 4th of December 2012 in the White Lady (Powder Room), at 8pm.